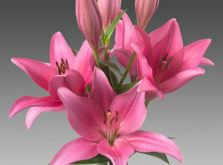 From ‘Asopus’ to ‘Zanella’, De Jong Lelies delivers a complete assortment of lilies – developed by themselves or coming from other breeders – to buyers all over the world. This is done with their full attention and extreme care. During the Dutch Lily Days 2019 we would be happy to introduce you to our wide-ranging assortment, the latest developments and our services that ensure we retain a prominent position in the lily market. 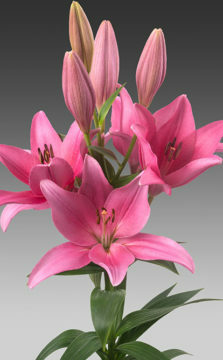 At our modern site in Andijk, discover a world in which lilies flourish. 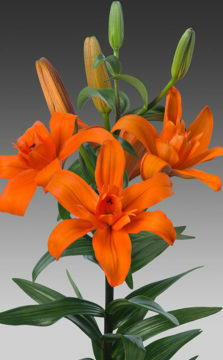 Unique and not to be missed are our double-bloomed Asiatic lilies and LAs. Our own breeding activities produce distinctive varieties, and we are happy to share the results of the programme with you. Familiar cultivars will also be on display: the complete trade assortment of Asiatic lilies, LAs, Orientals, OTs, LOs and Longiflorums. Experience the quality, speed and flexibility with which we at De Jong Lelies fulfil our breeding, cultivation and export activities. We have over 50 years of knowledge and experience to guide us. Yearround we ensure the best lily bulbs get to where they need to be in optimal condition, so you have access to the best quality of lilies.